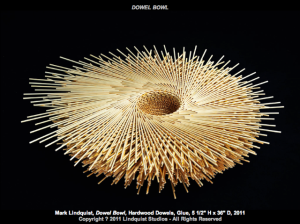 FSU Art MFA ’90 Mark Lindquist’s Dowel Bowl, will be on view at the Gadsden Arts Center beginning August 22. The work grew out of a challenge presented to Lindquist by Curator Ethan Lasser of the Chipstone Foundation: lay aside your customary set of tools, as a craftsman, and create a work of art using one tool alone. Lindquist initially refused Lasser’s invitation to be one of only 16 artists from the United States, United Kingdom, and Canada to participate in this project, concerned that he customarily uses a number of tools to complete his work. Ultimately, inspiration struck, and with Lindquist’s creative genius and wry sense of humor, and weeks of meticulous work, Dowel Bowl was born. The tool of choice: a glue applicator. Dowel Bowl has returned home after touring the United States as part of The Tool at Hand exhibition, and will join Lindquist’s Ichibaku Group: Mongaku, Natabori, and Yama Uba, on view in the lobby of the Gadsden Arts Center.